So I am super excited to be going back to Manchester this weekend. I went to Uni there and haven't been back since graduation in June. Gawd that was almost 7 months ago, how time flies. Most of my friends are still there so a huge reunion is in order. After Winter exams Manchester hosts a night called Pangea, spread over 14 spaces, housing up to 50 acts and thousands of students, over a 9 hour period- it is the end of exam extraordinaire not to be missed, even if I haven't actually sat any exams myself. This year's theme is wonderland. And my friends and I take fancy dress VERY seriously. This year? We're going as a flurry of pixies. Whilst the outfit's fine details may still not be completely ironed out, one thing for sure is my makeup is gannaaa need to last. So I need to make sure the the makeup I carry up North is in it for the long haul. 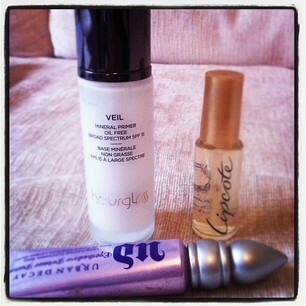 All primers are designed to increase the longevity of makeup, smooth over skin, minimise pores and keep shine and bay. The hourglass Veil does this and much more. What really stands out on the CV of this primer player is it waterproofing propensity. Once applied any makeup that has the privilege of sitting on top becomes waterproof by association. Talk about a stand out skill. This little number will keep the rest of my face in place through the inevitable sweating, rain, and tears (cam'an its Manchester and there's alcohol involved-it's never a student night out without those three making an appearance). With the Veil keeping my base in place Urban Decay's Primer Potion will be working some similar magic on my eyes, keeping my eye shadow in its intended place on my lids, not halfway down my face. With my face and eyes covered now all there is to take care of is mah lippie. The role of this falls to Lipcote. This cult favourite is designed to seal your colour in place. Making half worn lipstick a thing of the past. Nawt going to lie it is not the most pleasant thing to apply, and you can forget about it if you have cracked lips- it will hurt like hell. However when applied on top of relatively supple lips and lipstick its preserving powers pack a punch! Whatever else I ply on my face this longevity line up will guarantee my makeup stays whilst I play.